WATCH: Deadpool Red Band Trailer Is All Sorts of Badass | Nerd Much? We weren’t sure just how well Deadpool might translate to the big screen, but after seeing the first Deadpool trailer this morning (which actually debuted last night on Conan), we’re pretty sure it’s going to be a kickass ride. 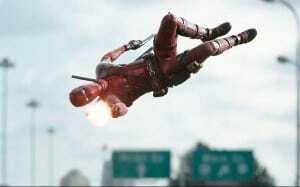 Deadpool is based on Marvel’s Deadpool comic, of course, which follows Wade Wilson, a mercenary who gains the power of accelerated healing and adopts the alter ego Deadpool. As far as the comic books are concerned, Deadpool was originally intended as a “bad guy” for X-Force and Cable, but since became a foul-mouthed antihero. He’s got a dark and twisted sense of humor, and the movie will tell his origin story, as he hunts down the man who nearly destroyed his life seeking revenge. We don’t know whether or not we’ll see Vanessa Carlysle (Deadpool’s love interest) as Copycat in the movie, but we’re interested to see if we do or not. The Deadpool cast includes Ryan Reynolds, Morena Baccarin, Ed Skrein, T.J. Miller and Gina Carano. The movie is being directed by Tim Miller. The movie is going to be funny and action filled, and we can’t wait to see it in its entirety next year. The Deadpool release date is set for February 12, 2016, and it’s on our list of the Most Anticipated Movies of 2016.